This light and elegant dinner is amazingly easy for the flavor it delivers. You can make this beautiful meal a part of any special occasion. In the summer feel free to replace the parchment paper for foil and put it on the BBQ . Sprinkle fish with lemon, salt and pepper and set aside. Saute’ onion, peppers, garlic, oregano, and tomatoes in olive oil. Cook on low until most of the liquid has evaporated. Cut filets into individual portions and place on squares of buttered foil or parchment paper. Top fillets with sauteed mixture. 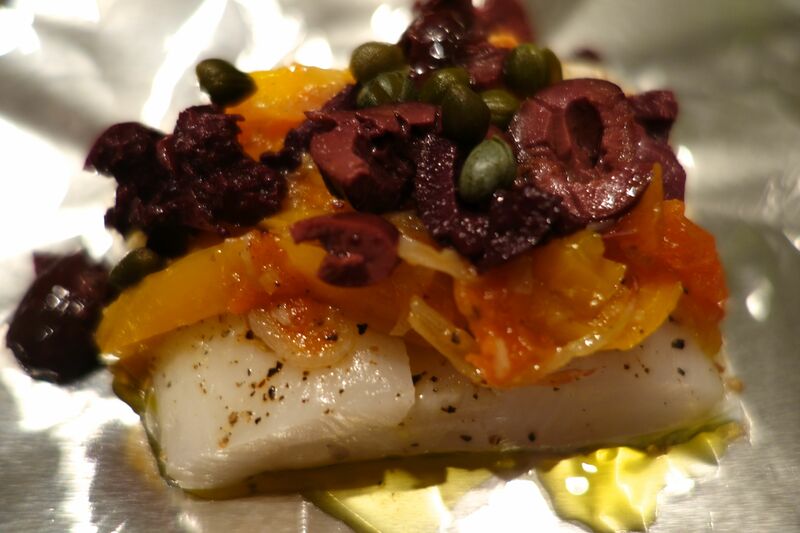 Sprinkle with olives and capers. seal the edges by folding to keep the steam in so fish cooks evenly. Bake or place on BBQ grill until fish is cooked. Goes beautifully with rice or a lovely green salad. This entry was posted on Tuesday, February 18th, 2014 at 7:08 pm	and tagged with baked in foil, easy and delicious nicoise fish wish, gluten free delicious dinner, gluten free dinner gluten free, oven fish dish, sea bass, sea bass in papillote and posted in Category. You can follow any responses to this entry through the RSS 2.0 feed.